Updated 18th Feb 2016 : Here’s the physical setup. And I have moved my own server installation to a USD $5 VM at Digital Ocean. Due to some very unfortunate incidents a few years back, I had to have home surveillance at my doorstep. Being a techie, I would never pay for the expensive licenses home surveillance software and solution, so I got to doing it myself. This is a simple illustration of my setup. 1. The server side motion detection features and capabilities is excellent. It’s comparable many commercial products that will cost an arm and a leg. 2. The access to the system is via the internet. That makes accessing the system very simple. 3. 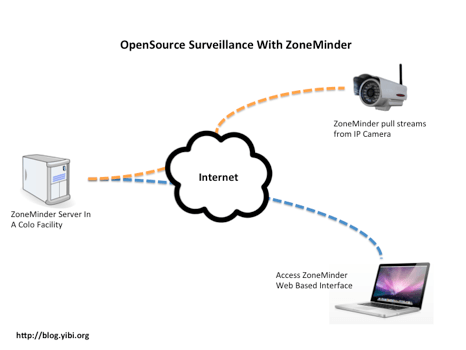 ZoneMinder works with a myriad of network cameras, from the very expensive cameras to my cheap China Foscam network camera. The server is a reasonably power machine running on CentOS. CPU utilization is not an issue yet with 2 cameras and motion detection turned on. My initial setup was using an ADSL line for the internet link. The uplink was pathetic, so I could only do 1 frame per second. Anything higher than that, my uplink will be congested. Just 2 weeks ago however, my FTTH line was activated. My current plan is a 50Mbps down / 25 Mbps up plan from M1. With this major speed improvement, I’m currently doing 10 frames per second. That’s the max my camera can go, otherwise I would like to try 15 frames or more. The current utilization is about 3Mbps per camera because ZoneMinder is pulling MJPEG. I’m now contemplating getting a another camera that supports H.264 for better image quality. Prev CloudFlare – How Does The Captcha Page Look Like?